A call to the Houston Repipe Specialists at TDT Plumbing eliminates aging, corroded or clogged plumbing pipes in your home, giving you new, long-lasting plumbing and peace of mind. Repiping can also provide improved water pressure throughout your home, improving hot water delivery, eliminating costly water damage repair bills and saving you money on water lost to an inefficient system. Low water pressure is an early indicator of plumbing trouble. That’s because pipes, especially galvanized pipes, develop water-restricting buildup and corrosion. Since incoming water pressure remains the same, restricted flow can eventually result in leaks. Leaks lead to water damage. 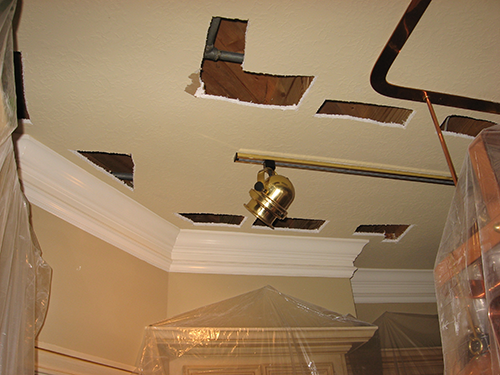 Water damage can lead to mold. TDT Plumbing repiping experts bring the experience of hundreds of repiping projects to solve plumbing leaks for homes like yours. While copper is an option, we recommend using PEX pipes. More affordable than copper, PEX (also known as cross-linked Polyethylene) is a high-density, durable plastic tubing that will not pit, scale or corrode. And, while it’s seldom a concern, the flexibility of PEX pipes makes them resistant to freezing. Repiping, whether using PEX or copper, has its downsides. Repiping means cutting into walls for access to existing plumbing pathways. The cost of cleanup and drywall repair is seldom factored into repiping quotes but is a time and consuming process. That process increases costs of the re-pipe. Because repiping leads to the nuisance of dirt, noise and the possibility of being without water, TDT Plumbing also provides you with a corresponding estimate for restoring your existing pipes instead using ePIPE in-place pipe restoration. ePIPE from TDT Plumbing clears and cleans your existing pipes from the inside and coats them with an epoxy coating, proving you with improved flow and better water. Best of all, it extends your pipes expected life by about 75 years. We believe you deserve a choice in addressing low water pressure and pinhole leaks. That’s why TDT Plumbing offers both repiping and ePIPE plumbing restoration. The choice is yours. Call (713) 697-2088 now. Or, fill this out and A TDT Plumbing pipe restoration expert will follow up to learn more about your issue and schedule an evaluation.